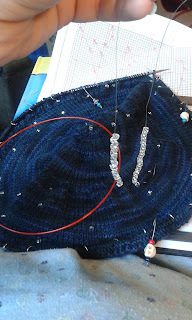 This is my preferred method for placing beads onto knitting. 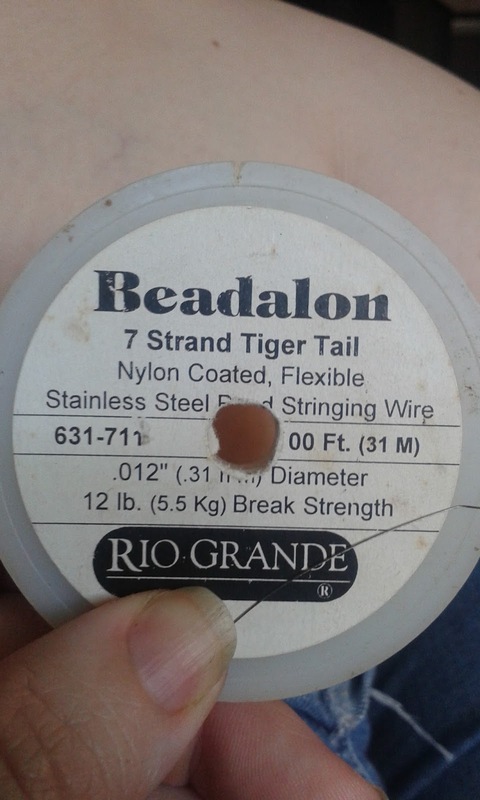 This is the same method as what people use dental floss, but the wire (found in the beading/jewelry making section) is stiffer and easier to handle. And once you have a kink in it you can load up the wire and set it aside and the beads don't easily fall off. 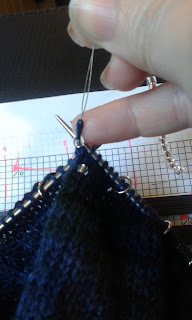 Also you don't have to worry about your hook splitting your yarn as you try to work the beads onto the stitches. This is the wire, it is a nylon coated steel wire used for jewelry making. 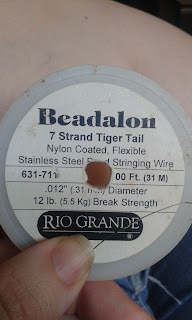 I use a larger gauge of this type of wire for my stitch markers. The fine gauge works well and allows you to use more of your beads. Seed beads don't always have a consistant sized hole in the center which makes some useless because you cannot get a hook into it. With the wire, you can use the beads which may have a smaller hole. I cut segments about 5-6" and put 1 bead on and tie the wire around it into a knot towards an end of the wire. This creates a stopper so you won't loose your beads. 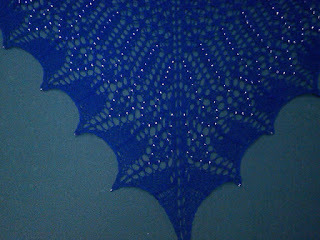 I'll use my current shawl, Celestarium, for this demo. load the wire up Leaving a long enough tail to fold over. Fold the end to put a kink in it (at least 1 inch from the end). 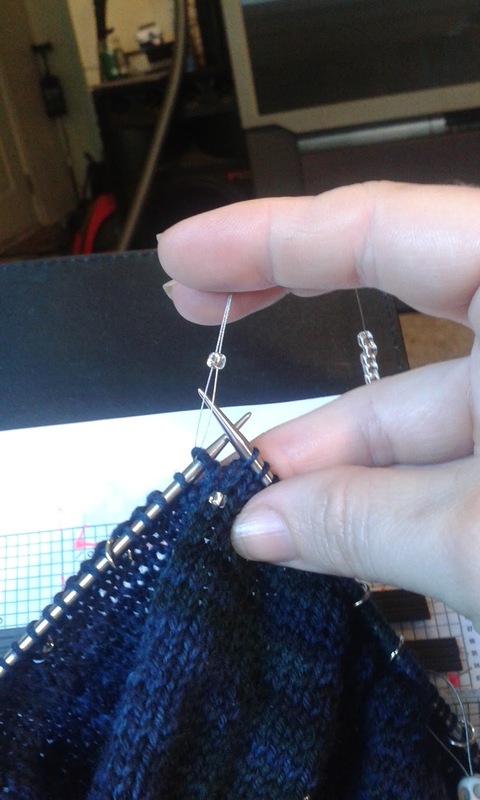 Holding both strands of the wire, pull the stitch off the needle. Slide a bead down and make sure to feed the tail of the wire through the bead as you transfer it onto the stitch. Place the stitch back on the needle and remove the wire and continue working. For this particular shawl I strung the bead onto the stitch before I knit it. 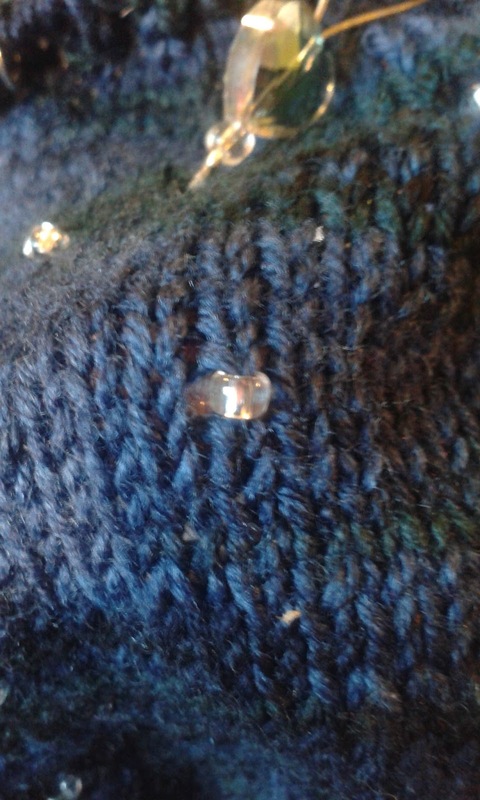 this creates a tight stitch and the beads sink back into the fabric to sit nice and snug. 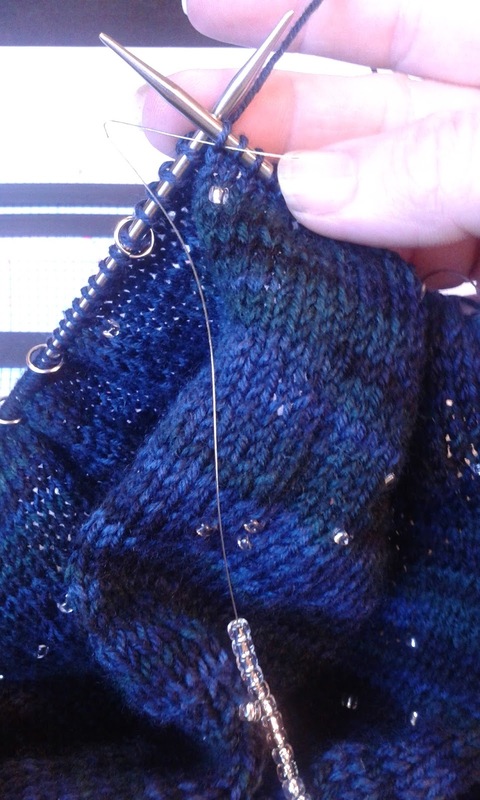 so I string the bead onto the stitch, place the stitch onto the needle and than knit it. 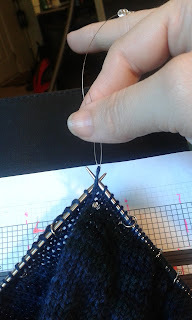 You can also place the bead onto the stitch you just knit. 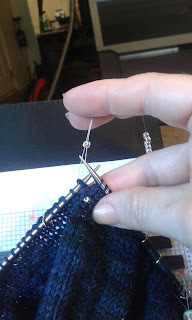 this will create a little more slack in that particular stitch because there is enough yarn to pass through the bead and go around the needle. I do this if I want to make sure the beads will stay on top nicely. Ilike if I'm following a line of decrease. It allows the bead a little bit of slack to be more raised on the surface. 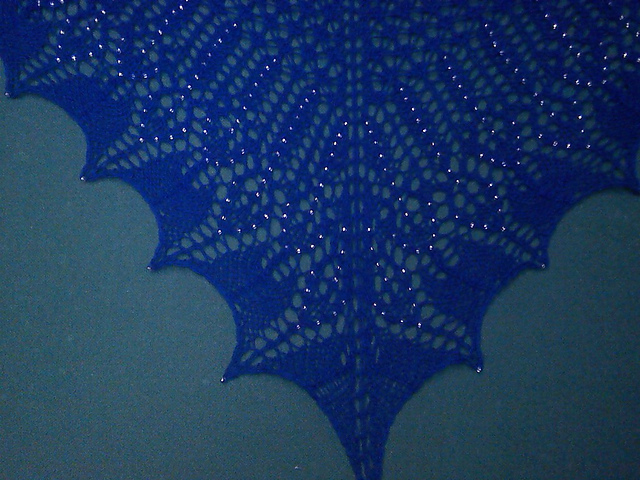 These are the beads on the Sagittaria shawl I did. I beaded the stitch after knitting it (knit the stitch, placed the bead and put back on the needle). They sit nicely on top of the lines of decrease. These particular beads were much smaller than the ones I normally use.